Additionally, airlines are regularly updating the travel requirements, so please check with your airline. Since 2015, thanks to our rigid protocols and adherence to the strictest ethics in the business, we’ve never had a single travel letter rejected. 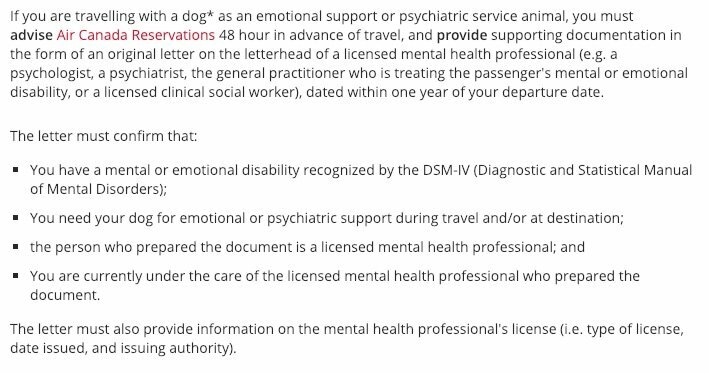 This package includes the needs assessment for an emotional support animal letter and a therapeutic care session with a licensed mental health care provider. The assessment and session will typically last 40-50 minutes, and can be one in one appointment. Those that qualify will receive two documents (in electronic and printed form). Only two signed airline forms per order. Additional forms are available (certain fees will apply). Most airlines are follow American Airlines‘ ESA documentation validation which includes “contacting your mental health professional.” Given our total compliance with federal HIPAA data privacy guidelines, unless a passenger/client purchases the additional airline verification service (which puts into place a signed HIPAA-waiver, allowing the sharing of protected health information), our clinicians cannot legally answer any airline queries. Must advise Air Canada Reservations 48 hour in advance of travel, and provide supporting documentation in the form of an original letter. Submit Special Documents at least 48 hours before departure, and keep the completed forms with you for the entire journey. Must email no later than 48 hours before departure with: confirmation behavior, mental health professional, and veterinary health. Professionally designed, full color logo and letterhead (often required by foreign air carriers). Many airlines and housing are now calling to verify the authenticity of the letter.